Well it's that Valentine's month of the year in a few days... February. This is a great winter month to cuddle up and show your love. FlagRunners love flags. There is nothing better for a flag than good flagpole parts. And that brings us to today's episode, continuing our journey along the Des Plains River Trail. If you have an older flagpole, if your flagpole is subject to harsh winds, or if you under-bought the first time around and got a flagpole that doesn't meet your weather location, consider not just replacing your flagpole parts, but upgrading. The Federal Life Insurance Companies' flagpole was not installed with these parts. These parts are clearly new. 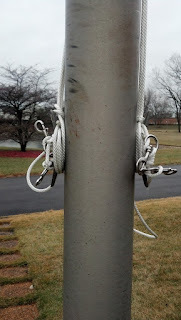 But this business didn't just get regular halyard, they upgraded to thicker, wire-center. They didn't just get standard snaps, they upgraded to stainless steel swivel snaps. In the long run, these flags will appreciate the lack of places the flag can fray. We'd also like to point out this knot. 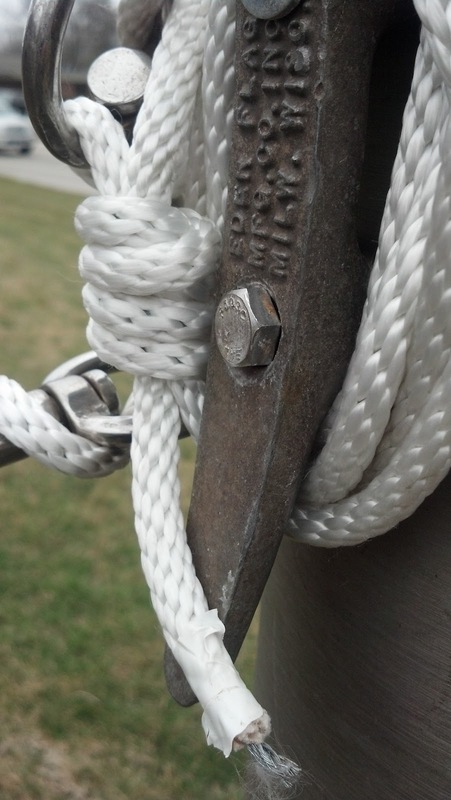 This is a great knot to keep your rope secure. We call this a double fisherman knot. It is a good idea to place this knot between the top and bottom snap hook. This way, if the heading of the flag goes or if the knot breaks, the flag and rope acts as a safety. Wanna learn this knot? Click here.